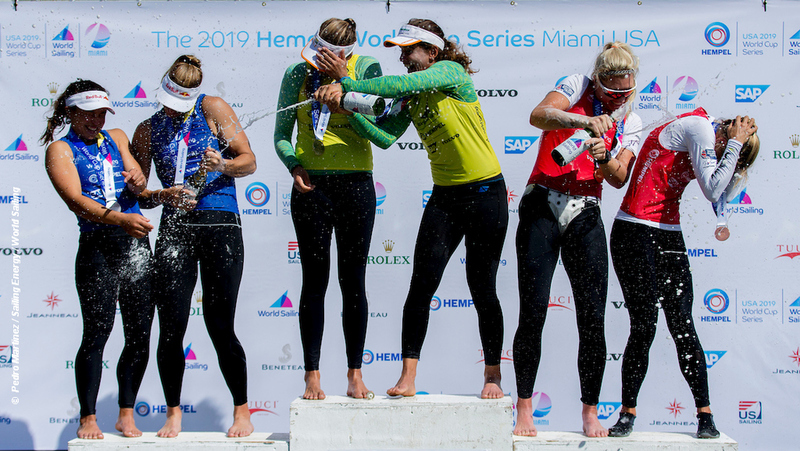 Day 5 of the Hempel World Cup in Miami sees the medal races for the 49er, 49erFX, Nacra 17 and RS:X classes. First medal race completed with Martine Grael and Kahena Kunze of Brazil taking 49erFX gold. Second Maloney/Meech NZL and third Dobson/Tidey GBR. In the second race, for the 49er, five boats were over at the start including the GBR pair Peters and Sterritt, only Fletcher and Bithell went back. Taking the gold it was Erik Heil and Thomas Ploessel of Germany. Second Fletcher and Bithell GBR, with third Fantela and Fantela CRO. In the Nacra 17, Aussie pair Jason Waterhouse and Lisa Darmanin made no mistake as they took the gold. Samuel Albrecht and Gabriela Nicolino de Sá of Brazil took silver, and bronze to Santiago Lange and Cecilia Carranza Saroli of Argentina. The British pair John Gimson and Anna Burnet finished fifth in the medal race and in fourth overall. In the RS:X women, Yunxiu Lu of China took the gold. Second was Katy Spychakov of Israel and third Charline Picon of France. Bryony Shaw was ocs and Emma Wilson finished fourth and ninth overall. Gold in the RS:X men went to Bing Ye of China with second Radoslaw Furmanski of Poland and third Pierre Le Coq of France.